2 Bedroom Terraced House For Sale in Glasgow for Offers Over £157,500. 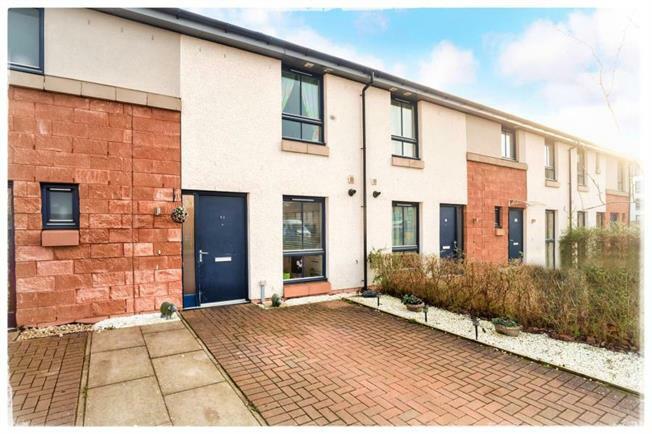 This super smart and rarely available larger style 2 bedroom house is located in the hugely poplar Oatlands Gate development which offers a convenient location for the city centre, accessing the motorway and has a newly finished footbridge directly into Glasgow Green. The property has its own mono-blocked driveway and main door, and comprises of a welcoming entrance hall with under-stair storage and large tiled WC, a naturally bright living space to the rear features patio doors opening to the private garden, there is a separate stylish kitchen which has modern white fronted units, is well equipped with integrated appliances including dishwasher, fridge freezer, electric oven and gas hob, plus a utility cupboard with plumbing for a washing machine. Upstairs there is a landing with storage and loft access, two double bedrooms, and the principal bathroom with stylish three piece suite, luxury fixtures including wall mounted tap controls and contemporary tiles. There is an enclosed rear garden with lane access to take bins out the back, and the property has a gas central heating system and double glazing. Well located in the popular Oatlands development which has a local shop and family restaurant with bar, the property is very well placed for accessing the M74 motorway giving links down south, Glasgow Airport and Edinburgh. There is easy access to the city centre and Merchant City with a great selection of shops, bars and restaurants as well as Strathclyde University and the City of Glasgow College.